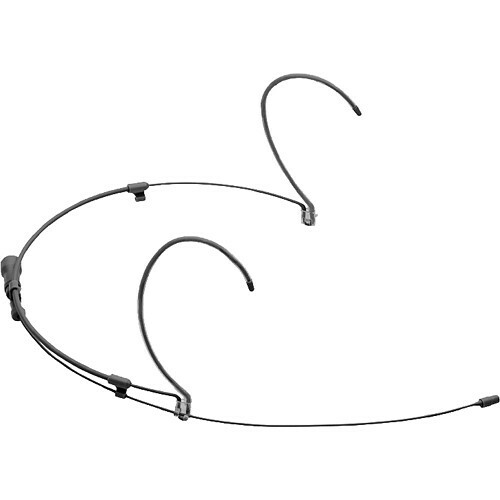 The black H6 Omnidirectional Headset with Hardwired Cable and 3-Pin XLRM Connector from Countryman is a low-profile headset microphone that combines the transparent sounding E6 Earset with a comfortable, lightweight, and adjustable headframe. Weighing less than one-tenth ounce, it can be used as a water- and wind-resistant mic for capturing audio in houses of worship, theater, and outdoor vocal and speech applications. The low-profile, omnidirectional H6 Headset virtually disappears against the skin, so performers forget they're wearing a mic. Three sensitivity options cover general speaking to extremely powerful vocals, and four color options allow you to match the H6 to your skin tone for minimum visibility. The H6 features a sealed connector with moisture resistance, a slim cable, and protective caps (+0, +4, and +8 dB) to adjust the frequency response. It is also available as a directional microphone with cardioid and hypercardioid caps. This omnidirectional H6 Headset's cable terminates to a 3-pin XLRM connector for direct connection to an XLR system with phantom power. The H6 Headset detaches from the cable with a rugged, tightly-sealed snap connection. Stainless steel tubing and wire provide maximal durability in a sleek design. Both earloops slide in and out to achieve a comfortable and secure fit on the head. The boom slides independently of the earloops to place the mic right at the mouth. The tiny 0.1" diameter capsule virtually disappears when worn and delivers natural audio quality. The directional version provides warmth and extreme isolation, while the omni version has a natural response with a minimum of wind or handling noise. An H6 snap-on 1.2mm diameter replacement cable installs in seconds. It provides a tight seal against moisture, is rugged, and available for almost any wireless transmitter or for XLR inputs with phantom power. Box Dimensions (LxWxH) 9.8 x 7.6 x 3.3"